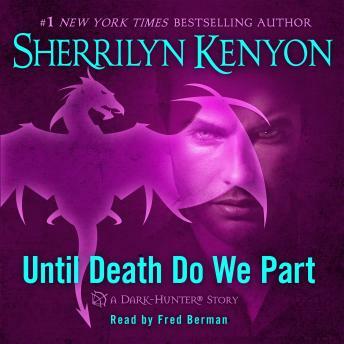 Previously published in anthologies, Until Death We Do Part is now available as a standalone audiobook from #1 New York Times bestselling author Sherrilyn Kenyon! The only thing worse than being Dracula's only daughter is betraying him by marrying his bitterest enemy-- a dark sorcerer warlord whose powers make a mockery of the legendary monster known for impalement and massacre. Forced to flee her father's wrath over her secret marriage, Esperetta is willing to sacrifice anything for Velkan Danesti, until she learns that he's tied their immortal souls together without her permission-- something she doesn't discover until after her father kills them and her husband sells both their souls to a Greek goddess for vengeance against him and makes them eternal Dark-Hunters sworn to protect mankind from the demons who prey on them.